I found this recipe from a blog called Damn Delicious. They served their pesto pasta with a fried egg, which sounds amazing. Who doesn’t like ooey gooey egg yolk all over your food. I do, but egg on my pasta didn’t sound too appealing to me. So I went a slightly different route by adding some chicken sausage to get some protein. Disregard the 95 word recipe title. Just call it Delicious Pesto Pasta. You won’t be disappointed. Trim the ends of the asparagus & spread out over a baking pan. Drizzle olive oil over the asparagus. Sprinkle with salt/pepper & minced garlic. Place in the oven for approximately 10 minutes or until the asparagus are tender & crisp. Remove from oven & let cool before cutting into bite sized pieces. While asparagus are roasting, boil water and cook pasta according to directions on the box. Slice chicken sausage and cook in a frying pan until heated through. Drain pasta once cooked. 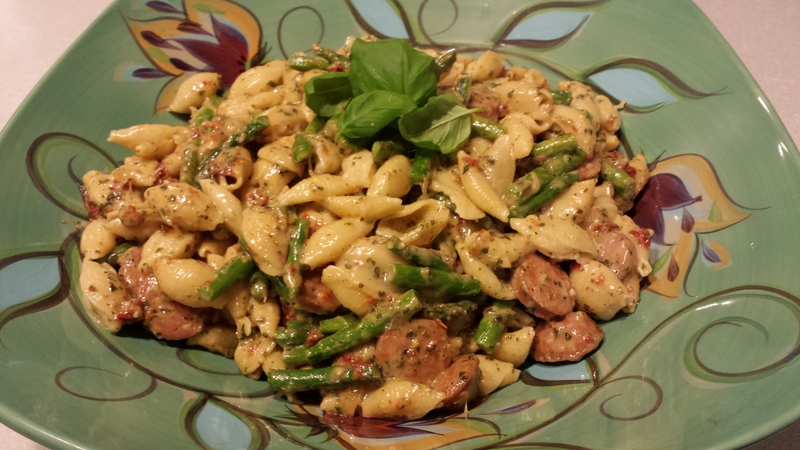 In a large bowl combine pasta, asparagus, sun dried tomatoes, sausage, mozzarella cubes & pesto. Mix until well combined & serve immediately.